In the competitive market of GPS units Magellan has made itself a household name and in this review we cover the latest product from Magellan called the 9055. In two words “BIG Screen.” The 9055 has the very noticeable (as stated by on lookers “I can read the screen from my driver’s seat” -from the guy in the car to my left while sitting at a stop light. 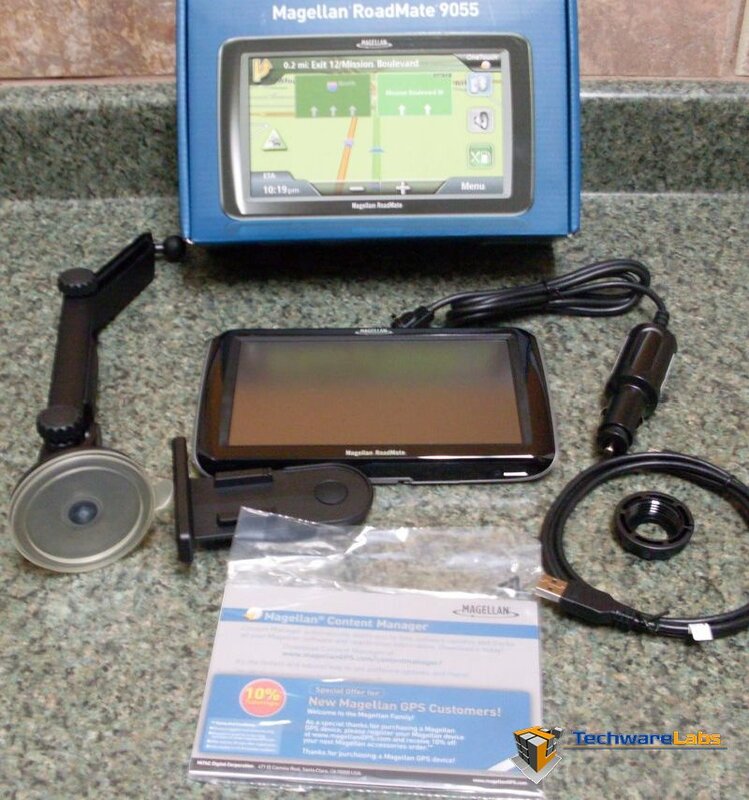 Those of you who are looking for a GPS with a slightly bigger screen than the average 3.5” or 4” screen the 9055 maybe right up your alley with a 7″. Lets take a look at what the Magellan 9055 has to offer. * Huge 7″ color touch screen is easy to view. * Enjoy hands-free calling and a noise-cancelling microphone for superior sound quality with advanced Bluetooth technology. Even store your contact information. * OneTouch™ favorites menu offers instant access to your personalized bookmarks of favorite places and searches anywhere you travel. With a single touch, find your favorite café or restaurant in any city. * A/V input to enjoy movies or music during downtime. * Built-in AAA TourBook® guide provides ratings and descriptions on AAA-approved places to stay, play, dine, and save. * Spoken street names and directions so you can hear upcoming turn directions. * Highway exit POIs search finds gas stations, restaurants, hotels, and more near upcoming highway exits. * QuickSpell® narrows your address and city searches, as you type, making destination entry easy. * Multi-destination routing lets you plan your trip with multiple stops. Choose the order you want or automatically optimize your route. Saving time and money. * AAA Member Roadside Assistance1 shows the AAA phone number and your exact location on the GPS navigator screen for easy reference. * Preloaded premium maps give you the latest maps and directions as you travel the United States, Canada and Puerto Rico. * Millions of points of interest (POIs) help you easily find gas stations, restaurants, ATMs, coffee shops, and much more. * Address book enables you to create and store contact information. * Auto night view adjusts your screen’s color and contrast for easy night viewing. * Automatic re-route lets you quickly get back on track in case you missed a turn. Requires AAA membership. Visit http://www.AAA.com/GPS for more details.